Promotes bone health & protects cells. Enhances vision & immune health. Directions: For persons 12 or more years of age other than pregnant or lactating women - take one softgel daily, as a dietary supplement, preferably with a meal. 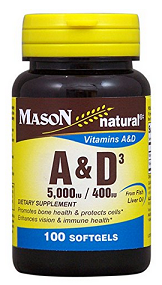 Ingredients: Vitamin A (from fish liver oil) 5,000 IU; Vitamin D-3 (from fish liver oil) 400 IU. Other Ingredients: gelatin, glycerine, purified water, mixed tocopherols, and corn oil.